For decades BIC has received numerous top-ratings and become recognized for offering audiophile sound for far less than an audiophile price. The new state-of-the-art PL-980 floor speakers not only follow this tradition, but take today’s horn loaded speakers to a new level! Unlike the majority of horn floor speakers on the market today, the PL-980s incorporate a 3-way multi-driver design rather than a 2-way design. Although many 2-way floor speakers offer outstanding performance, the PL-980's 3-way design enhances and refines mid frequencies which enable an extended soundstage, dynamic range, and frequency response. Their imaging and lifelike sound is as if looking through the performance stage front to back, very much like what is experienced audibly and visually at a live performance. The end result is the PL-980s reflect the warmth and 3-dimensional sound you would expect from high-end audio but for a fraction of the price! Perfect for both music and home theater applications, each PL-980 incorporates two high power 8” active woofers which deliver low frequency output. Then, two 8” passive radiators eliminate port noise while extending the bass even further. The midrange is a 5" closed back driver which delivers the all-important 1000Hz – 5000Hz articulation frequency range. The closed back prevents interference from the 8” woofers which ensures clean detailed midrange response. The 6.5” mid/high frequency horn tweeter produces rich detailed clarity and effortlessly achieves staggering high output to 119 dB (live rock band levels). Each woofer and midrange are fitted with elegant gloss black trim rings for sleek cosmetics. The enclosures include hand-rubbed black lacquer tops and bottoms. This extra step ensures a deep gloss shine that is more scratch resistant than most lacquer finishes on the market. PL-980s also have an extended 8 year warranty offering one of the longest in the industry! Designed and engineered to please even the most discriminating listeners, the PL-980s surpass the performance and enjoyment of floor speakers more than three times their price! *Front of Speaker 18" - 36" from front of speaker to wall behind speaker. *Typical placement- 24" from front of speaker to wall behind speaker. *Placement preference may vary with room size, room damping, and personal sound preferences. Design: 3-way, six driver tower speaker. Drivers: Two high power 8" active woofers, two 8" passive woofers, one enclosed 5" midrange, and one 6 1/2" mid/high frequency aluminum dome horn with neodymium magnet. We proudly introduce the new BIC/Acoustech Platinum Horn Series. Since 1973, BIC America has been known for offering top-rated, quality audio components at unprecedented low price points. Over the past several years, BIC Acoustech speakers have become recognized as a superb value in horn speakers for the home while offering extremely affordable pricing. The high efficiency PL-66 bookshelf/surround speakers deliver performance with lush, crystal clear sound for both music and video, They offer angled cabinets which enable wide dispersion reflection throughout a room. Each speaker contains one 6 1/2" mid/high frequency aluminum dome horn tweeter with neodynium magnet, one 6 1/2" woofer with heavy duty surround, and one 5" x 7" passive radiator for extended bass output. All Acoustech Platinum Series speakers come in elegant enclosures with hand-rubbed black lacquer tops and bottoms. This extra step ensures each cabinet has a deep gloss shine that is more scratch resistant than many lacquer finishes on the market. Flush wall mounts included. Design: Two-way three-component bookshelf/surround speakers. Flush wall mounts included. Drivers: One 6 1/2" high efficiency aluminum horn tweeter w/neodynium magnet, one 6 1/2" screen pressed long fiber woofer with heavy duty surround, one 5" x 7" passive radiator for extended bass output. Now you can enjoy the top-rated PL-200 subwoofer in wireless version. The Top-rated PL-200 is a superb performer driven by an audiophile state-of-the-art BASH amplifier capable of delivering up to 1000-watts dynamic peak output. It can move an impressive volume of air with exquisite control while delivering prodigious amounts of bass power for both music and theater applications. A sleek cabinet with hand-rubbed black lacquer top and bottom offers a deep gloss shine that is more scratch resistant than most lacquer finishes on the market. Like the BIC/Acoustech H-100, we guarantee the PL-200 will knock your socks off, especially for the price! Design: Front-Firing 12" Long-Throw Powered Subwoofer with state-of-the-art BASH amplifier. Frequency Response: 22Hz - 200Hz, adjustable crossover & volume controls. Drivers: Heavy Duty 12" screen pressed long fiber woofer with high power magnet and long excursion surround. Recommended Power: Built-in State-of-the-Art BASH Amplifier - 1000 Watts Dynamic Peak Output, 250 Watts RMS Continuous. The new BIC/Acoustech PL-200 II offers improved bass performance and more placement flexibility than the original top-rated BIC PL-200. PL-200 II is powered by an audiophile state-of-the-art BASH amplifier capable of delivering up to 1000-watts dynamic peak output. The PL-200 II’s dual flared front ports dramatically boost deeper bass frequencies providing a smoother frequency response, virtually flat down to 20Hz. 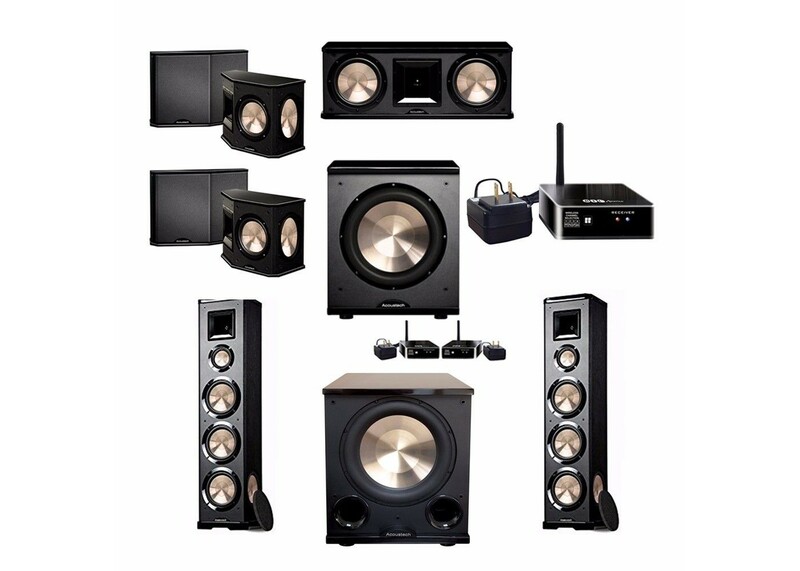 Add one wireless W-Receiver to a WTR-SYS system for each additional subwoofer or pair of powered speakers to play on the same channel as one that's already set to a BIC W-Transmitter. Extend your bass and add more wireless BIC powered subwoofers to your system with the purchase of additional BIC W-Receivers. Set your additional W-Receiver(s) to the same wireless WTR-SYS channel that your first subwoofer is set on. Enjoy 5.2 sound from a 5.1 receiver, 7.3 sound from a 7.1 receiver or 9.4 sound from a 9.1 receiver! Or, play what's running in your living room, basement, or great room in any other area of your home. Includes 1 wireless receiver, 1 antenna, 1 USB AC power adapter, 1 USB cord, 1 RCA to RCA stereo patch cable with male end, 1 RCA "Y" adapter cable with female to 1 male end and self-adhesive Velcro strips. Note - This bundle is made up of multiple products that will ship and arrive individually.